Click on an image twice to edit the features or replace it. Choose an image by searching through your computer’s folders. Choose an image from those available in the MailStyler Picture library. Add text to the images. You can increase or decrease zoom through the magnifying glass icon on the left of the image panel. When the Resize icon at the top of the screen is set to Crop, a red rectangle appears within the selected image that defines the visible portion once editing is completed. You can change the size by using the Width and Height commands found immediately above the image. The command Maintain Proportion, represented by the padlock icon, allows you to maintain the image’s proportion unchanged when you change the width or height. 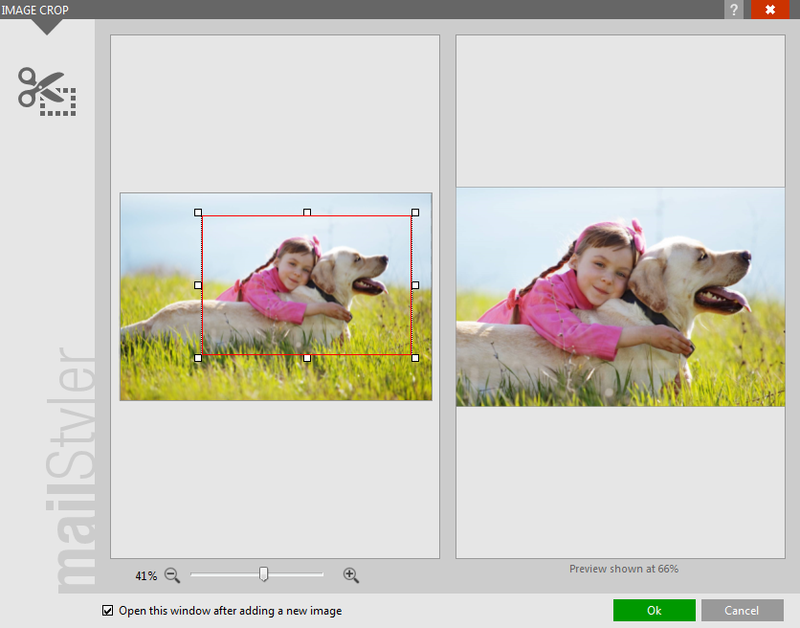 The Resize Mode lets you decide how the image will be resized. 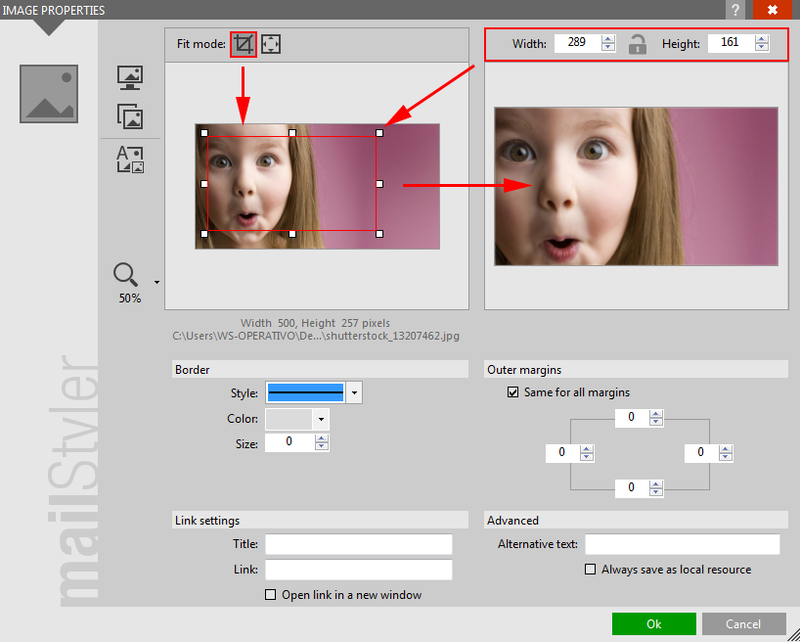 Resize Mode = Crop: the source image is cropped horizontally or vertically to best fit into the destination rectangle. Resize Mode = Zoom: the source image is shrunk or enlarged to fit entirely into the destination rectangle. Vertical or horizontal transparent areas will be added to ensure that the aspect ratio is preserved. Border: defines the style (invisible, solid, dashed or dotted), color (solid or transparent) and size (or thickness) of the image border. External margins: the space between the image and the elements surrounding it. The size of each margin (top, bottom, left and right) can be determined separately. If the All Margins Equal option is selected, the size of all four margins assumes the same value when the size of a single margin changes. Link settings: creates a link on the image. Title: is the text that appears when you hover over the image. Always save as local resource: choose where the image will be placed during the export process. 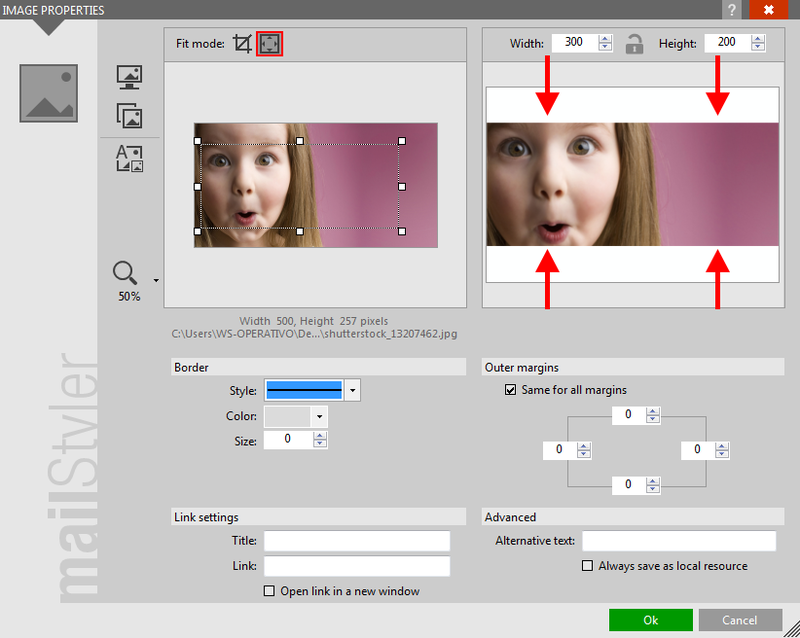 Check it if you want the image to be saved as a local file despite images destination option chosen during export. 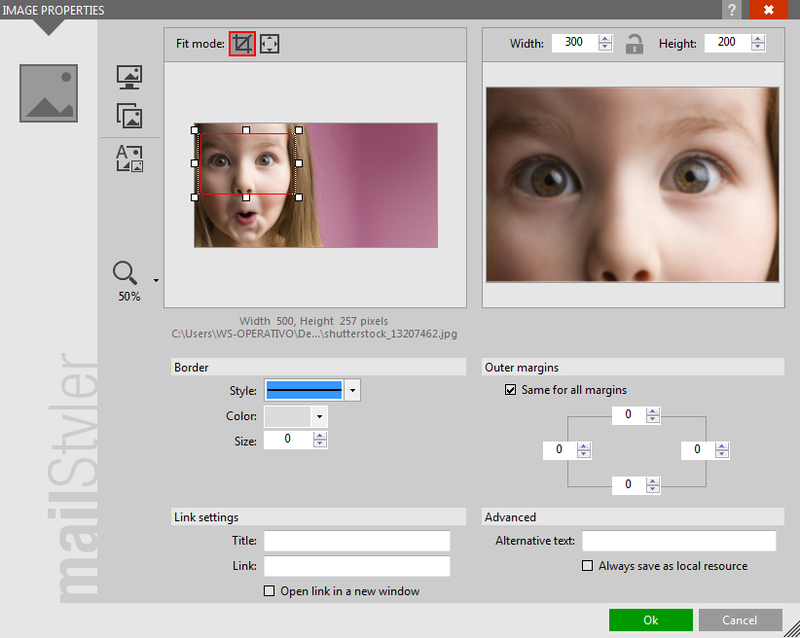 MailStyler 2 allows you to create complex graphics elements by combining text and images. To add text to the selected image, click the button Add text to image. The Image properties screen will open. Add text: allows you to add text (see the details below in the “Add text” paragraph). Add image from file: allows you to add an image from your computer (see the details below in the “Add image” section). Add image from library: allows you to add an image from the MailStyler Image Gallery (see the details below in the “Add image” section). 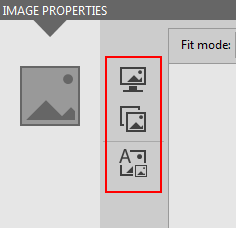 Select: with each click on the button, the elements (text or images) in your workspace are selected in sequence. Zoom: adjusts the magnification of the preview image. 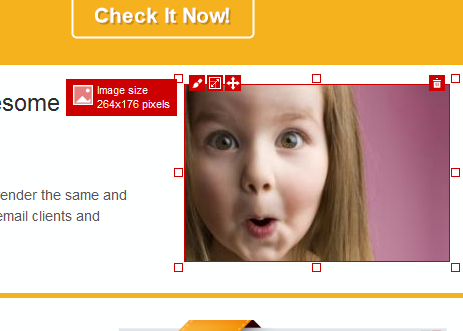 Save: saves the changes to the image and returns to the previous screen. Cencel changes: ignores changes made. 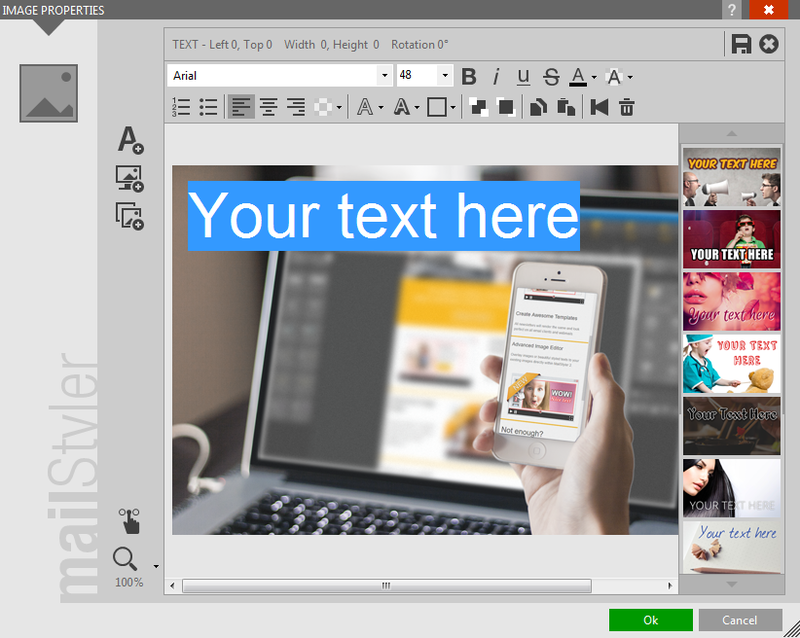 To add text click on Add text: the editing area contains the sample sentence “Add your text here.” Clicking it will display a red frame that defines the text area. To move the text box and its contents, place your cursor inside. The cursor will change to a hand. 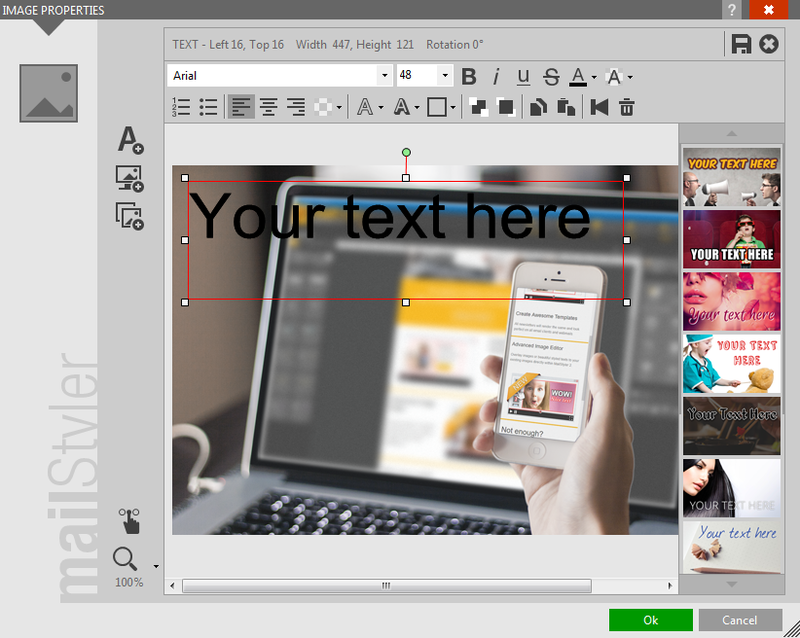 Hold down the left mouse button and drag the text area to the desired location. The size of the text area can be changed through the handles that appear on the edges. To rotate the text area, place the mouse pointer over the green dot above the text area. Hold down the left mouse button as you move the mouse to rotate the area. The location and orientation of the text area are shown at the top of the screen. You can quickly format the text using one of the pre-set styles shown in the boxes on the right. Click on the text and, when the border appears around it, click on the side box that contains the style you want to apply. You can preview text by hovering your mouse pointer for more than one second on one of the boxes. By clicking a box, the style is immediately applied to the text within the selected area. To return to the original look of the text, click on Reset, the last box on the bottom. Outline: applies an outline to the selected text. You can select both the outline color and size. Click on OK to confirm the changes made and update the image in the edit area, or Cancel to discard the changes. Add image from Library: to select an image from the Image Library. The selected image appears on the screen Crop image, where, if necessary, you can select and crop only a part of it. The original image is displayed on the left pane of the screen. You can adjust the zoom level by moving the cursor lower. The red border around the image indicates the part that will be used. If you want to add the whole image, click directly on the OK button. If you want to select only one part, drag the points on the edges and corners of the red rectangle until surrounding the area that you want to use. The preview in the right panel shows which part of the image will be added. 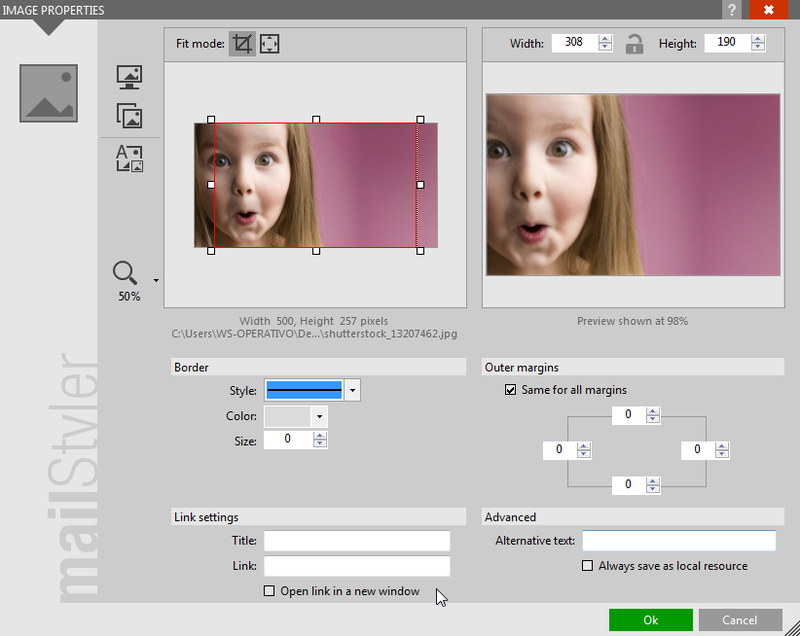 Click the OK button to confirm the selection and add the image to the workspace. Delete: removes the selected image.